One of our largest clients, also market leader in its space called us the other day and told us a problem they wanted solved. Over time, the company has built or bought various applications spanning nearly a decade. Their field sales force uses Sage CRM, but in order to get information from these assorted applications, they were dependent on the old-fashioned e-mail transactions. As business needs grew, so did the data volumes, and with it data duplication. Some of the applications did not have a web service interface. Some of the vendors who developed the applications were not in business anymore. It took some convincing the IT development team that web services enabling all applications is the best way to go forward. This had to be done in quick time and not seen as an EAI Project. 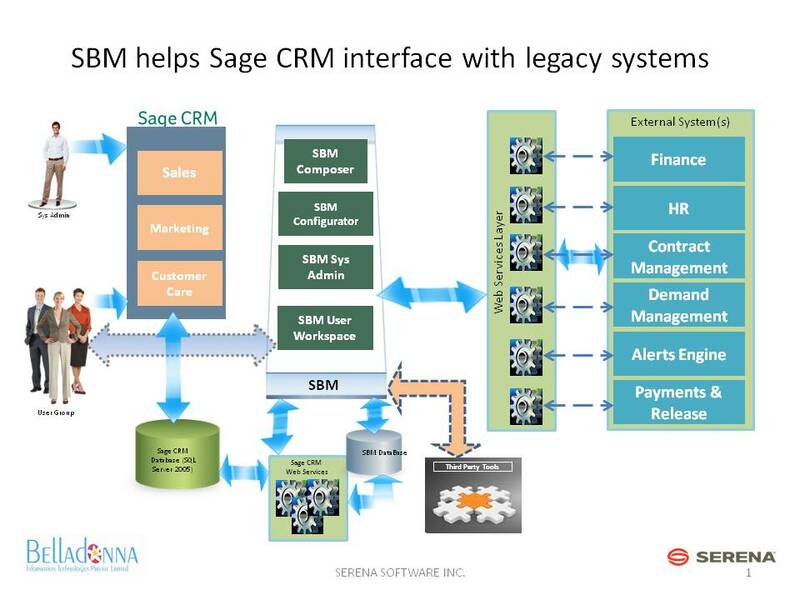 We approached Serena Software and they plunged into the problem along with our CRM implementation and development team. We were amazed at the speed and ease of use Serena Business Manager (SBM) could create the Proof of concept for us. We were able to achieve the speed and completeness due to the following reasons. Ability to create customer specific UI. Drag and drop features, instead of writing code and linking up various web services. Extensibility of the tool to cater to address the functional gaps, post integration. Here is the snap shot of the solution. (c) Belladonna Information Technologies Pvt. Ltd., Bangalore 2011.